Eggplants tops among my favorite veggies. This recipe is quite easy. The messy part is when you grill and peel the skin off the eggplant. Pierce the eggplant with a fork (3 on each sides). 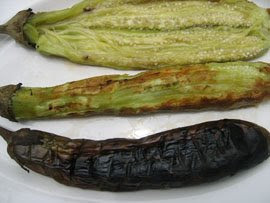 Cook the eggplants, broil on a grill or open flame or by boiling until eggplant is soft. Turn eggplants on every side to char the skin until wilted. Cool the eggplants before you peel off the skin, retain the stem for easy handling during frying. Flatten the eggplant by fork, set aside. Beat egg and season with salt & pepper. Heat oil in a medium pan. Dip each eggplant one at a time in the egg mixture and slowly slide it into the pan. Fry until golden brown on both sides.